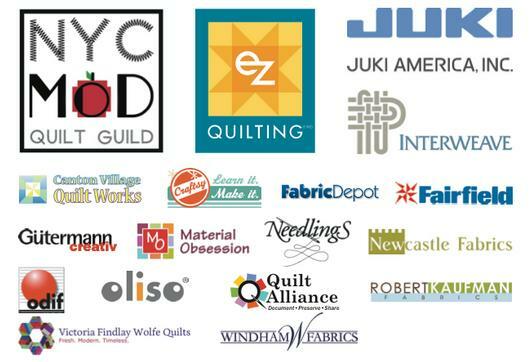 The NYC Mod Quilters have teamed up with EZ Quilting/Simplicity, Juki and Interweave for the Double Wedding Ring Challenge using the Darlene Zimmerman EZ Quilting/Simplicity Double Wedding Ring rulers. Remember the Dresden Challenge the SLMQD did with Darlene’s Dresden ruler? This is the same type of challenge and it is open to everyone who wants to participate. If a challenge isn’t fun enough, there’s a cavalcade of prizes and multiple categories to enter in. You can read all about the challenge here. The nice people at Simplicity have given me one set of Darlene’s ruler for a give-away for one lucky winner. More at the end of this post. The rulers can be purchased from participating retailers or you can purchase them directly from Simplicity here (and the optional solid arc here) or from Darlene here (and the optional solid arc here.). There’s a complete Dresden set plus the single arc ruler if you don’t want to make a pieced arc (like I did). This is the first time I made a double wedding ring quilt (well, mutant coaster quilt), and I found this tutorial on the Simplicity website helpful. I was putzing around trying to learn how to use these tools, and hopefully trigger an idea to make something unconventional and new with them. While I was playing with the rulers, I discovered a 10″ Moda layer cake is perfect for two single arcs and two connector squares. PERFECT! 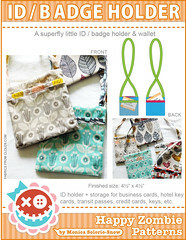 I dove into my Moda’s Happy Go Lucky by Bonnie and Camille stash and set out to make a mutant drink coaster. Four 10″ fabrics + background fabric = one ring. I made some paper templates to insure I’d cut in just the right spot. I used Robert Kaufman’s Kona Snow for my background. The tools are marked so I knew exactly what size pieces of Kona I needed to make before cutting out the shapes. Nif. Ty. I got a little cocky and went pin-commando. I wanted to use my seam ripper, anyway. A steam iron, pins (learned that the hard way) and a good spritz of starch is helpful. Lots and lots of pinning (the perfect job for a Duck Dynasty marathon) and patience and steam and more pinning. For a chance to win a set a tools, leave a comment and I’ll have random.org draw a number on Tuesday, July 23rd around noon-ish PST. If you want, you can comment what sounds more fun: a pieced arc or a single unit arc. Edited in: The giveaway has now ended, and using random.org for comments 1-156, the winner is #94 by BrendaLou. Congrats, BrendaLou!! This looks amazing! would love to enter the giveaway! Love the look of both, but i think I would choose a single unit arc! It shows off a little bit more of the fabric. I love the coaster you made, inspiring me to try one myself. Thanks for the giveaway. Wow, what a lot of work, but I’m game to try. I like the one you did but also admire the pieced arcs I see in blog land. Nice! I love your block. 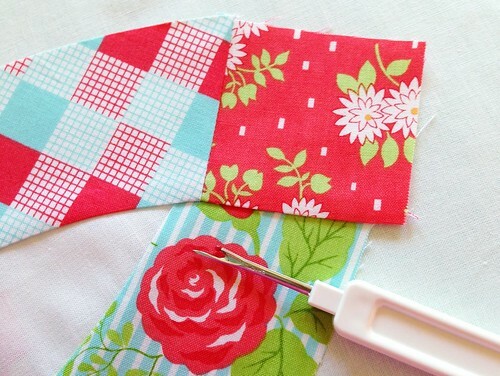 I’d love to try a pieced block. I love the single piece arc! It seems like a way to ease into all those curved seams which scare the pants off me! The pieced arc is SO VERY INTERESTING! I love the look of the pieced arc!! What a cute little mat! I can see a whole quilt using these fabrics with solid arcs. Wonderful! Beautiful! Hm, I opt for single unit arc as a start. Thanks so much! I have always loved pieced arc units, but the solid arc units on yours are beautiful! I love your coaster! Thanks for the chance to win! I want to replicate what you made, it is awesome! Thanks! The single arc looks more “fun” I have not done any curved piecing so I might be a bit frightened to try piecing an arc then curve piecing it! I made a DWR once, 3 whole rings, pieced. 20 years ago! Ready to try again but i’ll start with solid arc 1st. I’ve made a pieced double wedding ring…I think I would make the single arc next time. I think it is time for me to tackle a DWR. I have one that my grandmother made but I had to finish it. Quilt and Bind, (it was just the top.) I would love, love, love to win the rulers. I’m really liking the single arc but the pieced arc is really interesting! This is a block that has on my to do list for a long time, but always made me a bit nervous. Thank you so much for your wonderful photos and inspiration and the how to :-) Very helpful! Happy Quilting. Would love to try these new rulers! Pin commando…that made me laugh. sometimes these blocks have a way of spitting in our faces don’t they! But in the end you won. Such a cute mutant, I may be tempted to try it! Cute block - as easy as cake? :) Love the solid arcs, but I might try pieced ones. Thanks! Yours turned out so cool! 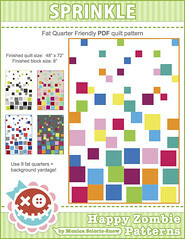 I love that fabric :) Seriously excited about joining this challenge! Love your coaster! THe colors are great! Thanks for the chance to win. I think a pieced arc sounds like more work, but it looks so pretty! I’d probably have to choose that :) thanks! I’m all for less work so no piecing. I might make a frisbee. What about a crazy pieced arc? A single arc would sure be more do-able! :) Love yours! I don’t foresee me making a whole quilt but I do see some potholders and towels trimmed with the arcs. OOO pick me please!!! Never done a double wedding ring, but it’s on my bucket list. A pieced arc would be a great challenge for me, and I love challenges! Wow - this would be a challenge. I like the look of the single pieced arc! thanks! I haven’t joined in because the wedding ring quilt ‘wasn’t my thing’ but I LOVE yours! I could MAKE this in HAPPY colors! Beautiful, just beautiful! I love this wedding ring quilt. I am new to quilting and really addicted. I love your color choices. So do you think that you’ll make a double wedding ring quilt? I’ve never made a DWR - I’d try a single first!! I love the look of the pieced arcs, but I also think that a modern interpretation of this quilt could be accomplished with solid arcs. Thanks for the opportunity! I’ve never made a DWR, but it looks like those tools would make it a lot easier. Your version is wonderful–as usual!! I like the single piece arc. Mostly because I haven’t tried too many curves. Seems like that would be the way to start. I love what you made! I need one of those in my life too! Oh fun! I have never tried this kind of piecing but I want to. These look great! I love it. I’m not sure though that I’d have patience for even one round. Love the clever little photos. You’re adorable. Wow!!! That is the sweetest coaster I’ve ever seen!! Now you have me intrigued and I would love to win this ruler set and try to make my own. Oh yuur double wedding ring is amazeing. 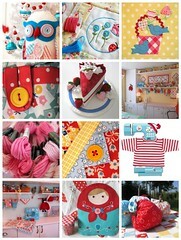 I really love those fabrics you chose to use. Very nice indeed. i like both the pieced and single arcs. I just love your choice of fabrics. I think I would like to try to solid arc in a line of fabrics I like (don’t know which one yet). Thanks for the opportunity to enter your drawing. This may be the easiest way to do a DWR. I’ve tried in the past and it was a disaster! You make it look sew easy! If I’m lucky, I do a single arc, no more piecing for me! And I’d keep it small. Oh, I love this, LOVE the double wedding ring and it’s on my bucket list of quilts to conquer. One day. Some day. The first quilt I ever pieced was a double wedding ring for my sister. I liked it so well I made me one. Both with a single arc and that was over twenty years ago using cardboard templates and a twenty year old pattern. Would love to do one again and try those new templates, they sound fabulous! I love idea of a pieced arc but oh so much work. I’d probably start with a single piece just to get a better feel for the tools and sewing all those curves. Thanks for the chance to win. HI! SOUNDS LIKE FUN! BOTH WAYS SOUND INTERESTING TO ME+I’M GOING TO TRY THEM! Your choice of colors is beautiful. Must admit I’m a beginner quilter and curves look quite intimidating! Thanks for such a great giveaway. Pieced arcs are my favorite. Thanks for all the great tips! 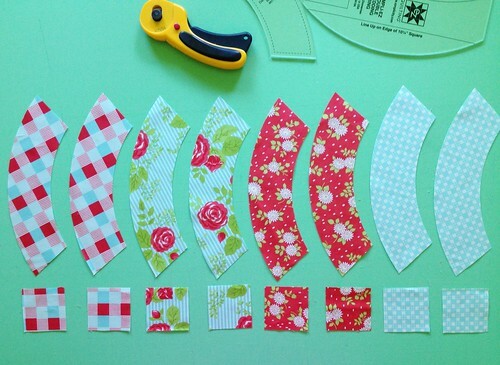 I love the DWR pattern…have done it several times, mostly as a one piece arc…would love to try a pieced arc - and doing a single circle looks like the way to go! Thanks so much for the great idea!!!! Now, I’d really, really, really love it if you picked me! Your single unit arch looks very doable for a first time DWR and curved seam virgin such as myself. Thanks for the give away! Pieced would be a great way to use scraps but I also enjoy my little bit of sanity I have left so I would go with single. Single pieced arc. I’ve got an idea brewing with just that. The seam ripper and I would be spending too much time together with a pieced arc. I have made a continuous arc DWR many years ago now but the pieced arc would indeed be a real challenge. The acrylic templates really do improve accuracy. It is really important to pin and to have your 1/4 inch seam accurate if you want all the pieces to fit and the quilt to lie flat. Thanks for the chance to win these beautiful temmplates. I have always been intimidated to try a double wedding ring quilt but with the rulers it just might be doable! Since I absolutely adore patch work I would choose that option. I have been busy making my first hexie quilt and can’t wait to start a double wedding ring! I think they both sounds like fun! I love your block!! SO pretty!Thanks for the chance to win! I would like to win b/c I have no idea how to curve-piece anything. Templates in general make me feel squirmy. But your mutant mug rug is pretty darn cute, so perhaps it’s time to learn something new. And win. 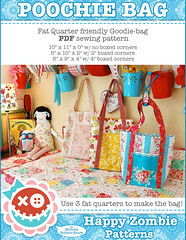 I’m a scrappy quilter so I’d love to play with the pieced arcs. I like the open spaces for quilting that DWR gives you. I think it would be fun to try a pieced arc. If I am going to try, I might as well go all in! I have never been attracted to Wedding Ring design until I saw this with great fabrics. Definitely pieced arch. I think I’d make a pieced arc. Thanks for the giveaway! How pretty! 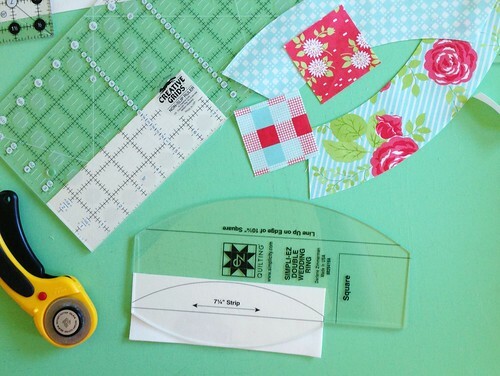 I would love to attempt a DWR & these tools look easy enough for me to use (as a beginner quilter) I would use the solid arc - piecing the arcs would be asking for trouble with my current skills! I can’t quite make up my mind if I prefer the single arc or the pieced one! Right now, I’m inclined to use both and throw in a couple of pieced triangles as well. I think the variety may add some interest! Yours is really cute thanks for the giveaway! That looks beautiful! Thanks for the giveaway!! Your mat is delicious. Love the fabs And this looks like a nice way to ease into a DWR. I’d love to try the rule set. A wonderful post as always. 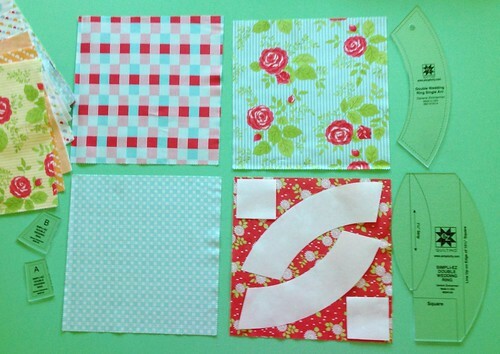 a pieced arc would be a great stash buster…but maybe more challenging than i care to take on?? thanks!! I love the double wedding ring quilt. this challenge may be the push I need to try it. It would be awesome to win this today since it’s my 40th birthday! 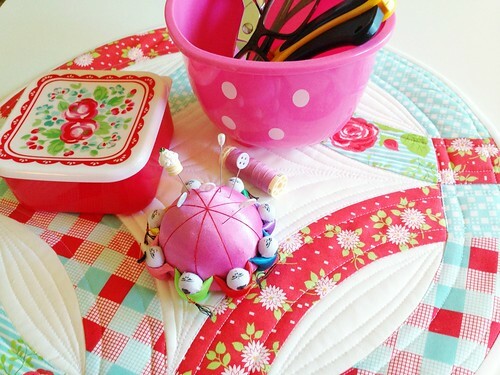 I love your coaster/mini quilt! I think I’d make a single unit arc to show off some special fabrics and then another quilt with pieced arcs to show off my scraps! My quilting cronies tell me I am a glutton for punishment, which is probably why the pieced arc appeals to me the most. I confess, though, I would love try a combination of both. Is that cheating? This wascmade for happy go lucky…so beautiful! I would love to give this a whirl! When you mention all the pinning I think I would have to settle for a single arc. I want a quilt just like your coaster. It is so cute! I made one the hard way back in the 70’s…I bet it would be a piece of cake to use these rulers. I’ve loved all of Darlene’s rulers I’ve used before. Please pick me! Very neat tools and project to do. I can see this in many fabrics, fun! I would do the pieced. mainly because I am insane. Did I miss it? What is the finished size of that mat? 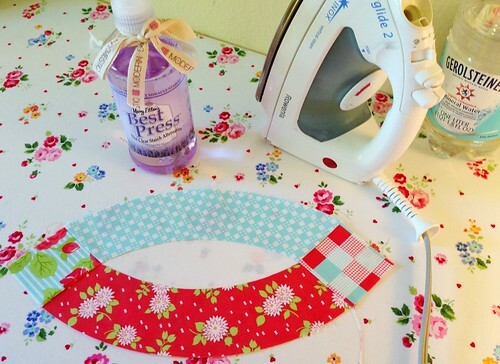 Love the fabrics you used and tha nice floral on your ironing board or whatever that was under the pieces. Thanks for the chance to win! 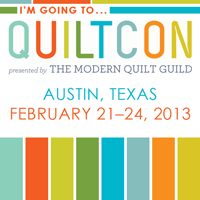 I actually plan on entering the DWR Challenge, my first quilt challenge/contest. I REALLY need these rulers!!! I’d love to win them from you, love your blog =). Thanks for the chance to win. A pieced arc would be what I would do. But I absolutely LOVE double wedding ring quilts. A definite classic that always draws my eye. I would love to make one and love to win the tools to make it super simple! 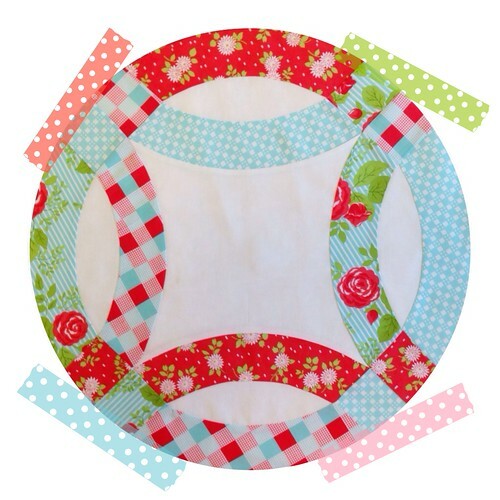 I think a pieced arc is really fun-looking, but the word “arc’ in conjunction with sewing scares me a bit. If I won these templates - I would face my fear and give curves a chance. Thanks for the layer cake tip! I’ve started thinking about my DWR for the challenge and I think I want to try English paper piecing it. Could be awesome or a total disaster, I guess I’ll soon find out. I think it will be a mix of pieced and single unit arcs for me. I think the pieced arc sounds fun! Your mutant drink coaster looks fabulous in Happy Go Lucky. I would love to attempt a DWR. I love double wedding rings but have never been game to make one. 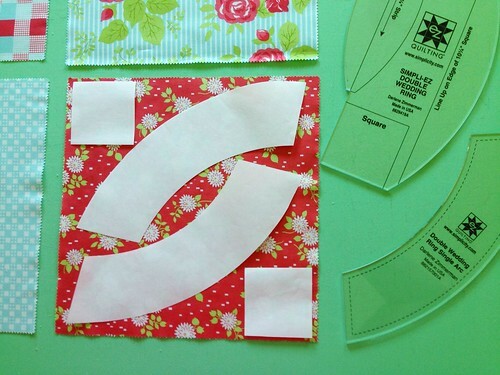 I like the single fabric arcs - not only is there less piecing but the larger pieces can be used to showcase beautiful fabrics like you have done with the Happy Go Lucky fabrics. Looks amazing. Always wanted to make one. could never quite figure out how. I love the idea of using a layer cake for this design. 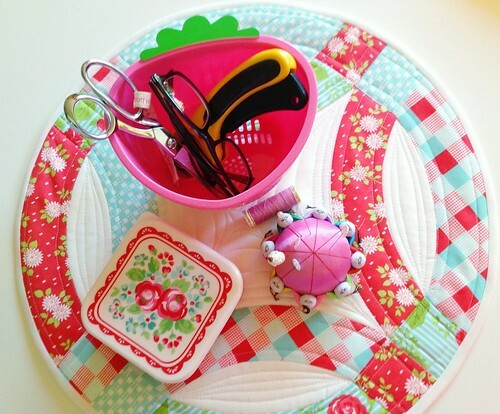 I’ve made a pieced pickledish mini before which was cool but it would take forever to make an entire quilt like that. The solid arc is something I’d love to try next. Your mini is super cute! Pieced arc for sure. Thanks for the opportunity! Really sweet wedding ring block you’ve made. I think I’ll go with the pieced arc. I love this pattern and have always wanted to try it. This may just be what I need to try it out. Thanks so much for sharing. I like the way the non-pieced arc displays the fabric. 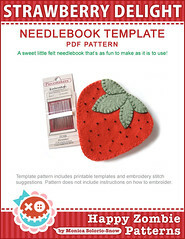 Gosh with the right fabrics the pieced one sounds pretty but you really cant go wrong with a single arc. Thank you for hosting the giveaway. 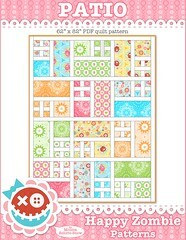 You quilted arc is gorgeous! Loved the fabric and colors of your DWR project. I hope to make one with bright, scrappy “made” with the single arc template. Thanks for sharing! Single!! Plus, you are awesome. Love that! I like that cute little box too. Where did you find that? 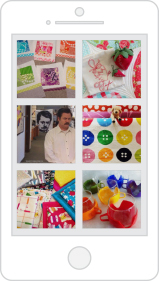 Thanks so much for a chance at the rulers… love DWR quilts and hope to attempt one someday! I think a pieced arc has more possiblities of fun. I love the single unit arc!! I think it looks so modern! So pretty! I’d love to try that! I assumed I’d want to make a pieced arc ( being the chronic bit-off-more-than-I-can-chew type) but I love your solid arcs. Maybe it’s the B&C fabric that swayed me! Very cute mega-coaster. Makes me want to make my own. i want to try both! The single one piece arch is the one I would like to try. Oh thanks for letting us know about the 10″ squares or layer cakes. Now to decide on a background color. A pieced arc seems more fun. I think I would try the single arc first. I love the more modern look! That looks so fun! I think I prefer the solid arc. 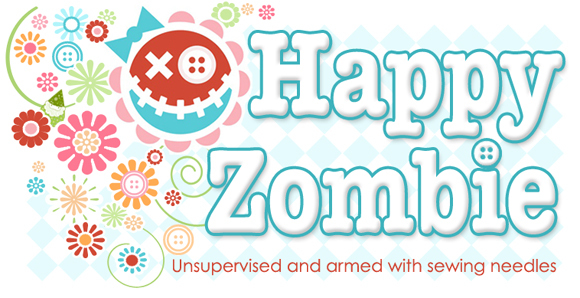 I think the pieced one would be pretty, but…”fun” to make??? Your sample is great! That might be the style to try first! Definitely both! Would love, love, love to win the tools! Your coaster on steroids makes me smile really yay big! Awesome! I haven’t made a double wedding ring block in 25 years. I like the look of the single arc. Looking good Monica! I really like the pieced arcs but I worry that my OCD piecing would kick in and I’d be hospitalized! 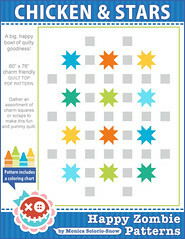 love the DWR quilt and an opportunity to win a set of the tools. Thanks for a great giveaway. The easiest route would be to do the single piece arc. But I am always up for a challenge so I would choose the multiple arc version. 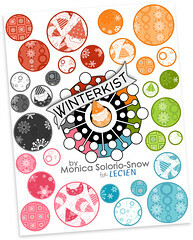 Would love to win a set of templates. Would love to give this a try. I love scrappy projects. I think I should start with the single arc, but I think I would like the look of a pieced arc. 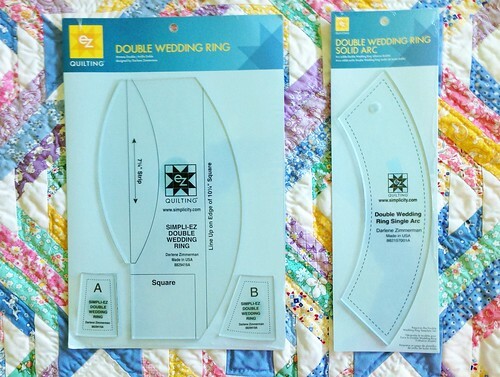 I would love to win the templates so I could make the double wedding ring. Thanks. I’d love to try the single arc. Thanks for the chance! Since fun for me is maximized when frustration is minimized and I have never even attempted a wedding ring quilt, I think the single arc would be more fun to start. Thanks for the chance! I’ve seen an old double wedding ring that had the arcs pieced with triangles, not sure I’m up for that but it would be a great way to show of favorite fabric. The pieced arc reminds me of a quilt my great grandmother made by hand! Oooh, I loved the idea of a pieced arc! I’m so excited for this contest! Love your block. I would try a pieced arc. Ahhhh - I would LOVE to win a set of these rulers. I’ve been working on a quilt for a friend using a paper pattern (she got married in May, so I’m a bit behind) and have had the worst luck with my seams matching up. I can’t give up because I’ve promised it to her but it’s been a close call. Thanks for the helpful links, I’m going to check those out now and see if I can figure out what I’ve been doing wrong. Because your version is so darn cute I have to enter the giveaway!!! Thank you for having it. Being as I live on the edge, a pieced arc sounds like my style. Thanks for the inspiration. I have a DWR on my To Do List. 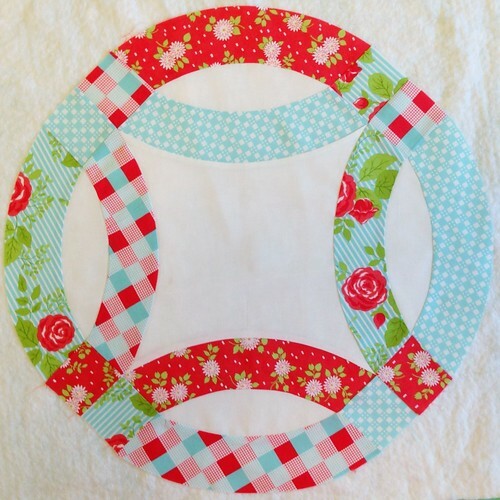 I’d love to make one with pieced arcs. I would love to try a Double Wedding Ring! One of my favorite quilt patterns. Love that there is templates available. Ooooh, gorgeous! I think I’d try a single arc first, then try a pieced one. What fun!